1. Heat 5-6 cm of vegetable oil in a large deep pan or deep fat fryer, to 180°C, or until a small piece of bread browns in 10 seconds. 2. Cook the tortillas, in batches, for 1 to 2 minutes, until golden brown then remove with a slotted spoon and drain on a kitchen roll lined baking sheet. Leave to cool slightly before serving. 3. Fill each tortilla with the 3 different types of ice cream and divide the slices of banana between them. 4. Melt the chocolate and oil in a small bowl over a pan of gently simmering water, until smooth. 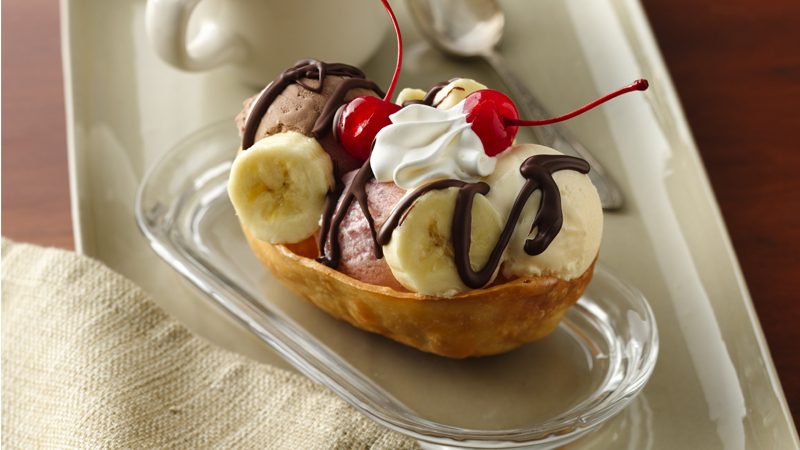 Drizzle over the ice cream and bananas. 5. Whisk the double cream with the icing sugar, in a medium bowl, until soft peaks form, and spoon over the tortillas before serving with the cocktail cherries. Fresh fruits are a great addition to these dessert tacos. Why not try fresh raspberries, strawberries or blueberries. Bring an extra texture to the dish by serving with chopped nuts. Hazelnuts, peanuts and pecans would all work well.